are added to this site. 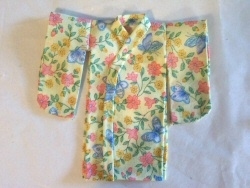 Kimono Pattern printed on CARDSTOCK - Click here for kimono pattern. Step#1 - First, tear off a piece of wax paper to protect your work area. A piece approximately 11 x 14 inches should be fine. Using pen, transfer pattern onto wrong side of material. Make sure the arrows go in the same direction on the material. 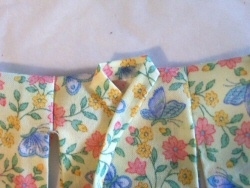 The Body pattern piece and the Collar piece include a 1/8" seam allowance. HOWEVER, the Sleeve Pieces do not and you must leave 1/8" all the way around the pieces. Step#2 - Be sure to transfer all markings as you will need these marks to continue. Step#3 - Cut all peices out. 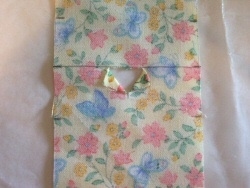 On the sleeves, be sure to knotch out "corners"(see photo), clip rounded corners and cut on marked lines. Step#4 - Before we began gluing, let me just say that I find it works best to put either a thin line of glue or a series of small dabs which I then smear with my fingertip. I keep a bowl of water and a paper towel handy so that I can rinse the glue off my fingers when it becomes too sticky. 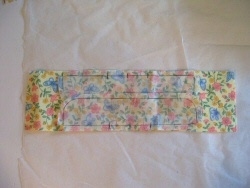 Cut a "T" in the middle of the body fabric and glue the corners down. This becomes the neck opening. 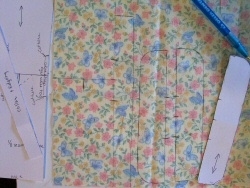 Step#5 - Place a line of glue between the cut markings on the RIGHT side of fabric on the Body Piece. 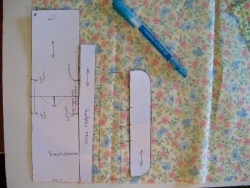 Step#6 - Place one sleeve RIGHT SIDES TOGETHER on the body fabric and match markings. Press firmly. Repeat for other sleeve. 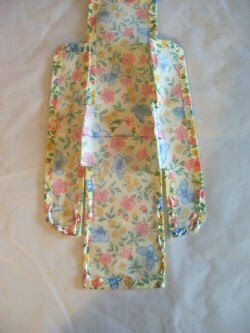 Step#7 - Your kimono should look like this now. Leave to dry. 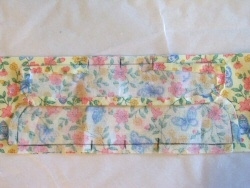 Step#8 - Taking the collar piece, put a line of glue on the top edge and fold about 1/3 of the way down. 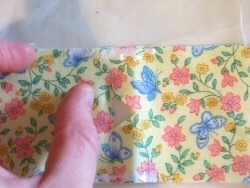 Step#9 - Put a line of glue along the remaining edge and fold over. Press firmly. 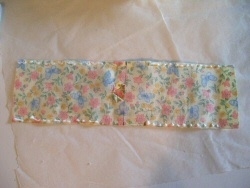 Step#10 - The collar should look like this. Set aside to dry. 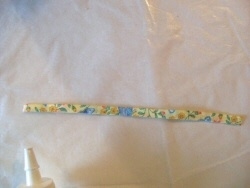 Step#11 - Put a line of glue around the outside edge of the sleeve, leaving the marked area open. 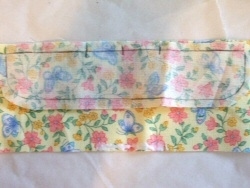 Turn edges over neatly and press firmly. 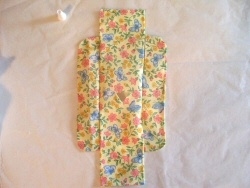 Step#12 - The sleeve should look like this. Repeat Step#11 for the other sleeve. Turn piece over. 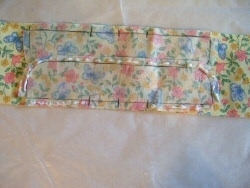 Step#13 - Dab glue around the outside long edges of the body piece and fold over about 1/8". Press firmly. Step#14 - Now glue the short ends of the body piece. 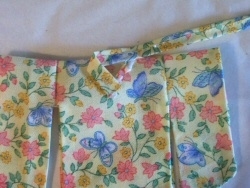 Step#15 - Turn your kimono over and gently pull sleeves away from the body piece. It should look like this. 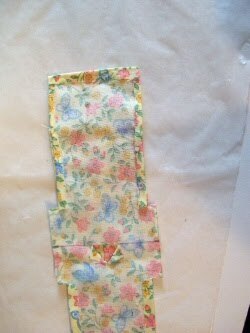 Step#16 - Add glue on the bottom 1" of sleeves and about 2" along sides of body piece. Press firmly. 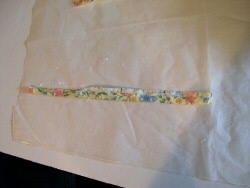 Step#17 - Add a line of glue around collar. 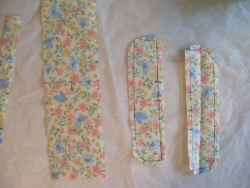 Step#18- Take collar piece and attach it to the glue on the body piece. 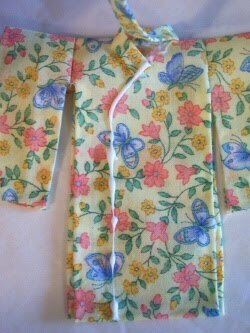 Step#19 - Add a line of glue to give the impression of the edge of the kimono. 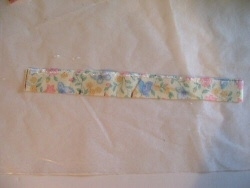 Step#20 - This should neatly cover the unfinished edge of the collar and the end of the collar piece. Step#21 - Bring the collar piece all the way down to the bottom of the kimono and secure the end of collar piece to the inside of the kimono. 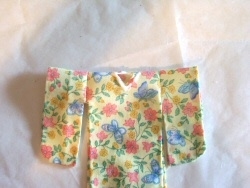 Your kimono is now finished and ready to be displayed!